For more than two decades, Debbie Wasserman Schultz has dedicated her public life to working on behalf of the people of South Florida. On November 2, 2004, she was elected as a member of the United States House of Representatives, and on May 4, 2011, was elected chair of the Democratic National Committee after being nominated by President Barack Obama. In Congress, Wasserman Schultz is a tireless advocate for women, children and families, authoring numerous pieces of legislation to advance their health, safety and security. She serves on the Committee on Appropriations and is ranking member of the Legislative Branch Subcommittee. She also serves on the Subcommittee on State and Foreign Operations, where she advocates for funding for security, economic, and humanitarian assistance, and works to reduce poverty around the world. 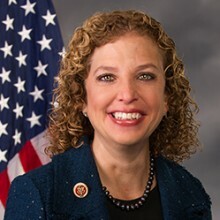 The first Jewish congresswoman ever elected from Florida, Wasserman Schultz introduced a resolution that passed the House of Representatives and called on the President to declare a Jewish American Heritage Month. The President subsequently did so, with the inaugural month in May, 2006. In March 2009, after she announced her own battle with breast cancer, Rep. Wasserman Schultz introduced the Education and Awareness Requires Learning Young Act, or EARLY Act (H.R. 1740), a piece of legislation that directs the Centers for Disease Control and Prevention to develop and implement a national education campaign about the threat breast cancer poses to all young women, and the particular heightened risks of certain ethnic, cultural and racial groups. This bill became law as part of the Affordable Care Act in March 2010. As DNC Chair, Wasserman Schultz works every day to advance President Obama’s agenda, to elect Democratic candidates across the country, and to promote Democratic values. Wasserman Schultz was born in Long Island, New York, and received her bachelor’s and master’s degrees from the University of Florida. She and her husband Steve live in Weston, Florida, with their three children.